On Friday night the news broke, that the Romney campaign was planning to reveal the vice-president in a live TV covered event at 9:05am the next day. Within a few hours however, all major news-outlets stated “Mitt Romney picks Paul Ryan”. There was no question mark, no speculation. Only these plain statements – quoting sources close to the campaign. Online, there was however very little indication on 8/9/12 that the information was leaked: The USA Today/Twitter Election meter showed negative sentiments towards both candidates at an all time low (since #Twindex data was revealed to the public): Obama 20; Romney 12. This number was stable until late Saturday evening when the Twitter index was finally updated – which seems to happen only once per day: Obama 32; Romney 39. Is @PaulRyanVP an appropriate Twitter name? That’s a verified account. Would @MittRomneyPOTUS be appropriate? Are there rules for this? Romney campaign aide Beth Myers confirmed in a statement to the press, that Romney had already made his pick earlier in August, after he returned from his first visit abroad. She presented the campaign’s strategy on how they kept the decision under wraps right after the announcement to the press. @140Elect reports that the @PaulRyanVP Twitter account was created on August 2, 2012 which confirms that the VP decision has already been made weeks ago. It is unclear however why the campaign chose to reveal the candidate two weeks later, on a war ship at a time when only half of the country can watch the news at 9:00am on a Saturday morning. The Romney campaign clearly had their sight set on Twitter and ignored Facebook – the Paul Ryan Vice-President Facebook account was established just an hour before the official announcement. A recent article in the Guardian pointed to the Obama campaign’s “Holy Grail” of campaign technology: the so-called “Dashboard“. The “data acquired by volunteers from voters canvassing in Ohio will immediately be synced with that gathered by those running phonebanks in New Hampshire and with the outreach efforts of volunteers at myBarackObama.com, giving campaign bosses a real-time master view of the president’s re-election efforts throughout the country.” According to the article, “more than 100 statisticians, predictive modellers, data mining experts, mathematicians, software engineers, bloggers, internet advertising experts and online organizers” are still working on verifying that the tool is working according to plan before more details are released. Today, President Obama published a new presidential memo building on the efforts of the Open Government Directive he encourages departments and agencies to save money by providing government records in digital format – instead of “paper and filing cabinets”. The new effort calls for reports, by each agency head, describing their current plans for improving records management programs; outlining current obstacles to sound, cost-effective records management policies;and cataloging potential reforms and improvements. The agency reports will inform, and be followed, by a Records Management Directive, to be issued by the Director of OMB and the National Archivist. The Directive will focus on maintaining accountability to the American public through documenting agency actions; increasing efficiency (and thus reducing costs); and switching, where feasible, from paper-based records to electronic records. In addition, all statutes, regulations, and policies must be reviewed to improve government-wide practices in records management. The tweet was not answered by the President, even though it seems very different to the pro-marihuana agenda many people were pushing during the Open For Questions event. This one seems to be intelligent, with implications for overcrowded prisons and a sense that the consequences of legalizing marihuana might actually have a positive long-lasting impact on the legal system in the U.S. and could save government a lot of money. This week the White House blog posted a message from Macon Phillips, the White House Director of New Media, titled “TooManyWebsites.gov”. This initiate is part of the Campaign to Cut Waste that the White House launched this week, quoting the President: “As President Obama has said, we can’t win the future with a government of the past.” Phillips estimates that as part of the over 2,000 top level domain sites, more than 24,000 subsites were developed over the last years to display government content. As part of this effort, all new .gov names are stopped and need to be directly approved by the federal CIO, who will first map out the existing landscape to see if a new site is necessary. Within a year the plan is to cut half of the federal websites. This mandate has also sparked other concerns for me: What about agencies starting blogs or adding social media accounts to their online presence? Many of the third party social networking services providers are creating new URLs for a social media account. Do these URLs count toward the cut? Do the SNS need to find a way to allow for folding account URLs into the existing .gov domain names? Does this mean that the agencies and departments are no longer allowed to create new accounts and with that new URLs? Or are external URLs excluded from this effort? The White House has recently asked its Facebook fans and Twitter followers to provide feedback on their social media activities. As an example, Twitter users were asked to fill out a short survey (see article in InformationWeek). * 50% of Facebook survey respondents were over the age of 50, with another 35% between 35 and 49. Our Twitter audience is younger, with only 32% of respondents over the age of 50. A combined 62% are over the age of 35. * 62% reported visiting our Facebook page at least once a week. However, 93% say they read tweets from us at least once a week. * A much larger percentage of our Twitter survey respondents are active on Facebook (80% of Twitter followers use Facebook weekly) than our Facebook respondents reported being active on Twitter (30% of Facebook fans use Twitter weekly). * Over 50% of respondents from both surveys reported never using Flickr, LinkedIn and social bookmarking sites (such as Digg, Reddit, and Delicious). * Over 56% share White House Facebook posts on a monthly basis and 78% have shared at least once. However, only 35% of responders report retweeting @Whitehouse on at least a monthly basis, with only 58% having retweeted us at least once. * The top requested content includes news-oriented posts (Breaking News, the latest news from the Administration), interactive posts (ways to engage with Administration officials, announcement of live streams, quotes from major speeches as they happen) and the Photo of the Day. Data.gov in the classroom features resources for K-12, Universities, and Education in the World. Among them is Karim Lakhani’s Data.gov case study developed at Harvard Business School, Beth Noveck’s Democracy Design Workshop Do Tank, and now also my Government 2.0 syllabus. I have been teaching this class for the last three years and the online syllabus shows a combination of resources I use for a semester-long course. As one of the motivations why my MPA students might find it valuable to participate, I use President Obama’s Open Government and Transparency memo, that asks the executive departments and agencies to be more participatory, transparent and collaborative. Especially in the class on Transparency, I refer to data.gov and the students have to think about ways to motive (local) government to provide datasets, make those datasets machine readable and how citizens can use the data provided. 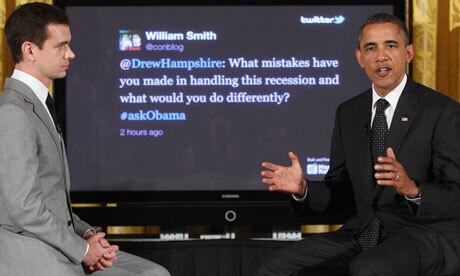 Government 2.0 – or the use of social media in the public sector – has become a hot topic. Agencies and departments on all levels of government are adding Facebook, Twitter or YouTube buttons to their otherwise static – infrequently updated – websites. It is still not clear how successful and useful social media is in the public sector and how agencies can design their own social media strategies. The term Government 2.0 was coined by Eggers in 2005 as the way that “Unhyped and therefore unnoticed, technology is altering the behavior and mission of city halls, statehouses, schools, and federal agencies across America.”, and he goes on describing Government 2.0 as “A form of digital revolution that transforms government.” Only with the successful Internet campaign and use of social networking sites such as Facebook and Twitter of the then presidential candidate Obama the term was picked up again and is now widely used to describe the use of new forms of technology such as free and open social networking services in government (sometimes called social media or new media). President Obama’s so-called Open Government memo from January 21, 2009 called for a more transparent, participatory and collaborative government and directed “Executive departments and agencies should harness new technologies to put information about their operations and decisions online and readily available to the public.“ Today, Government 2.0 is the “hyped” form of the use of social media in government and by its diverse stakeholders that transforms the way that government interacts with citizens in a participatory, transparent and collaborative way. The use of social media and the actual participation of all federal departments and agencies were reinforced by the Office of Management and Budget director Peter Orzag’s executive directive giving agencies a 60-day deadline to publish their open government plans and upload their first datasets to a dedicated website called data.gov. In April 2010, Cass Sunstein, Whitehouse advisor, published a memo that specified the use of social media in government advising the heads of the federal agencies and departments on how to handle content published and public feedback posted on social media sites under the Paperwork Reduction Act. While agencies were hesitant at the beginning, the GSA’s “Terms of Service Process for Free Social Media Products” with no-cost social media providers made it easier for agencies and departments to pick and chose the applications they found useful to promote a greater openness. What we can now observe is a surge to use social networking services in government: almost every federal agency and department has at least one Facebook organizational page and at least one official Twitter account – many even have a dedicated social media site which aggregates all their different accounts (see for example cdc.gov/socialmedia). Although for many agencies it has become mainstream practice to use social media applications and “be where our audiences are”, it is clear that not every agency has the same goal or a dedicated social media strategy. Some start by setting up blogs, Facebook fanpages, several Twitter accounts, YouTube channels, etc., but the actual use and outreach proves to be very diverse. The first strategy can be called “Push” strategy: The new medium is used as an extension of the existing (usually relatively static) Internet presence and is used as an additional communication channel “to get the message out”. This results in un-moderated Twitter updates that are mainly used to publish press releases or appearances of the secretaries, unmanned Facebook walls that are blocked for public comments and sparsely populated YouTube channels. The second strategy can be called “Pull” strategy: Social media applications are used to bring audiences back to an organization’s website, where the news is aggregated (to avoid losing control of what happens with the information). Pull strategies are actively involving audiences using some degree of interaction that result in a few comments from on Facebook walls and a few retweets (reuses of messages by other Twitter users) or answers to comments on responses from Twitter followers. Examples include the CDC’s use of social media tools to alert and inform the public about peanut salmonella outbreak or its H1N1 flu campaign. The third strategy – and at the same time the least observable – can be called “Networking” strategy. The use of social media tools is highly interactive with a lot of back and forward between the agency and its diverse constituencies. The new media directors usually have a sense of who is following them and who they want to reach. They are using Facebook, Twitter, etc, very strategically not only to control and direct messages to their audiences, but also to have their ears and eyes on the channels where the actual issues are being discussed that might be of relevance to their agency’s or department’s mission. Social media tools are not only used for mere publishing purposes and are not viewed as a time sink of the already overworked IT staff, but as a strategic information sharing and knowledge creation tool involving social media champions from different content areas. One agency that stands out is GSA that used an informal social networking site called GovLoop.com to create a group and discuss their “Acquisition 2.0” strategy. The discussions of a diverse audience of government employees has led to the creation of the Better Buy wiki project (see betterbuy.fas.gsa.gov) that truly transforms the acquisition process of GSA multibillion dollar budget: Tenders are now “crowdsourced” – meaning that vendors and agencies are asked to submit their revisions to the final document before it is officially released for solicitation. •	It is necessary to get people on board and don’t put the use and content creation on the shoulders of the one-person IT shop, instead understand the need to socialize your strategy and find champions who are interested in experimenting with new media and include them in early efforts. •	Social media does not replace the existing traditional channels of communication with government’s stakeholders, instead it provides a test bed for new ways of interactions with citizens and public. •	Design your social media strategy around the mission and the audiences you are trying to reach and not the necessity to be out there and part of the movement. Make a conscious decision what your expectations are and if you have the manpower to actually interact and network with your audiences. •	Reach has not yet proven its value and measurement of the outcome is difficult. The pure number of Twitter followers or Facebook fans does not indicate the actual impact. It is more important to understand who follows your Twitter or Facebook profile; what do your followers do with the content and who is in the network of each of these followers: Social networks have the ability to distribute information from friends to friends and their friends and can therefore reach many more than just the few directly following your updates. •	While a lot of rumors circulate about generational differences and that the main audience are young citizens, it has become clear that social media tools such as Twitter and Facebook have the highest increase rates in the age group of +35 year olds. Moreover, the Facebook newsfeed has the potential to become an important information mechanism that aggregates traditional media sources with information spreading through the trusted friendship network people are paying attention to. Over a year into the Government 2.0 movement it is clear that social media is here to stay and not a fleeting fad. Although there is a surge to jump on the bandwagon, deciding how the different social media channels fit into an agency’s mission is a crucial step that should involve top management but also all departments that might populate the social media channels with content.